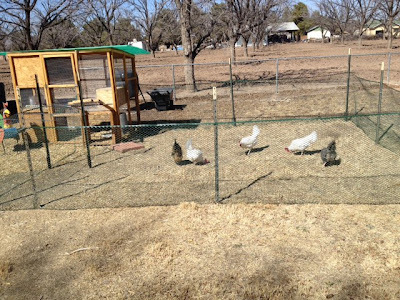 We finally got our expanded chicken yard made and covered over with netting. At last the girls can run and flap their wings and explore a little more of the world while staying safe from predators and our playful dogs. I know the new area looks a little bleak - this is the desert after all. However, once the pecan trees start leafing out and our old lawn grass starts to grow, things will look better. I know that any grass growing within the pen will get eaten before it can grow much but luckily I discovered grazing frames for chickens: You plant grass to come up through screens, allowing the chickens access to the greenery while protecting the roots, which the hens would otherwise tear out. 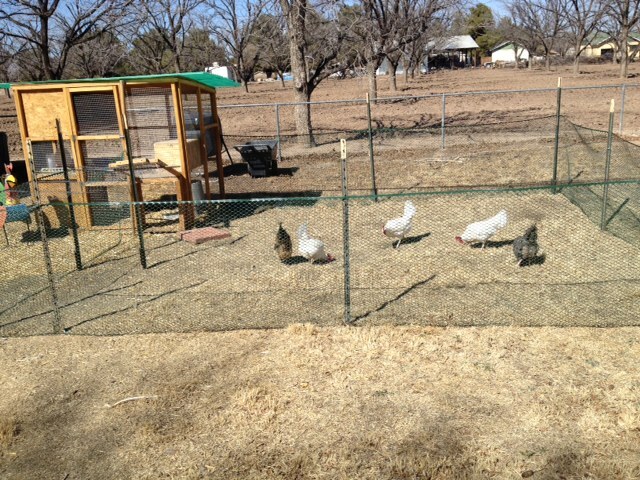 See photos and instructions on how to make grazing frames here: http://www.thegardencoop.com/blog/2012/02/07/grazing-frames-backyard-chickens/. We may not be the greatest carpenters, but we'll try to convert some wooden pallets into frames so that we can plant some grass, marigolds, and nasturtiums for the girls. In the meantime, I've been looking around for thoughts on what sorts of things make chickens happy. I've collected lots of articles and information on my Pinterest board, called "Chickens!" You can find it here: http://pinterest.com/clairz77/chickens/. If you haven't done so already you might have to sign up for Pinterest to see it. Don't worry, you'll enjoy yourself. Not shown in the picture above are some of the things I've just added today for the chickens' delight: Some semi-rotted leaves which probably contain lots of interesting bugs, nice green weeds I've pulled, an old log to climb on, and a somewhat dead potted plant for the girls to deconstruct. They've rewarded me a thousand times over. 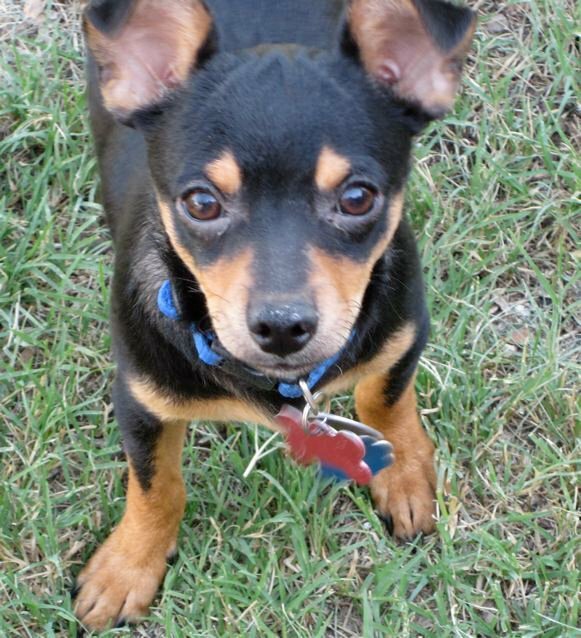 I love to sit out there, little Dweezil the Pup in my lap, and just enjoy the chicken world. The girls hum, and cluck, and chuckle and sing; they announce both upcoming and just-laid eggs, and they call out congratulations to the latest egg layer. They run after flies and take dust baths in the sunshine. They wander from the yard to their waterer inside the coop, and from the sun to the shade. They look like happy chickens to me! 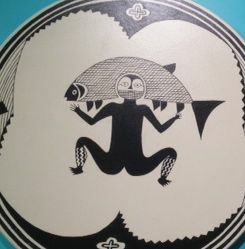 This photo has appeared on the blog before; I still like to take it out and look at it closely every once in a while. 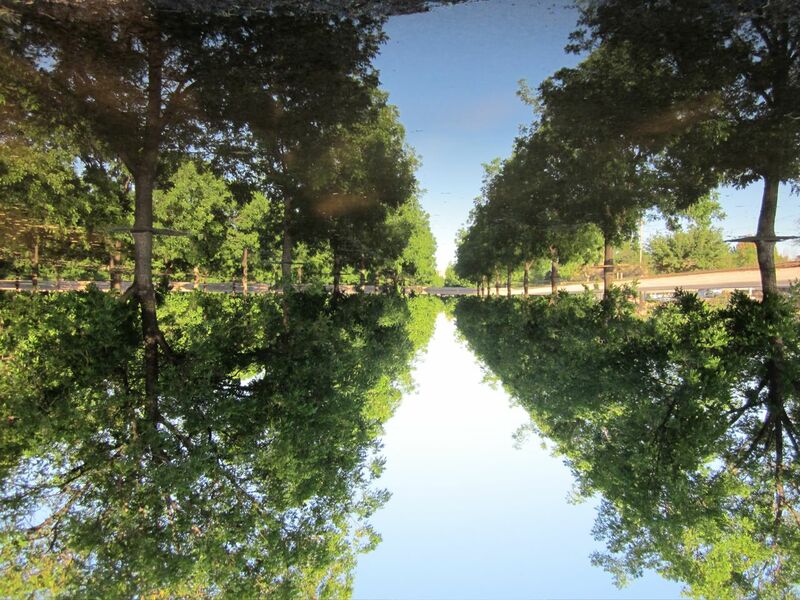 Although it appears to represent reality, it's really a sort of photographic riddle. 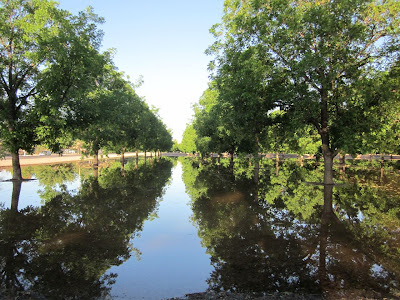 Our property here in the Chihuahuan Desert of southern New Mexico is a fenced-in lot with a few big trees, some cacti, a vintage adobe house, a garage, and a chicken house; it is surrounded by pecan orchards that are owned by someone else. I am always grateful for the shade and the bounty of these trees, some of which drop their pecans onto our yard. We have a huge supply of pecans in the freezer, we have pecan-shelling/sharing parties with our friends, and we cook with pecans all year round. I am also grateful that someone else does the work and makes the decisions associated with the orchard: The plowing, fertilizing, pruning, harvesting, and the watering. As our drought continues and less irrigation water is available from snowmelt via the Rio Grande, wells are being drilled and groundwater pumped out to water the trees. The expense grows, as does the moral dilemma. How much water does one dare to bring up from the ancient deposits below the surface of the desert? When should farmers here just say enough is enough, and leave the pecan-growing to the farmers in rainier places like Georgia, where the trees are grown without the need for irrigation? In the meantime, we are left to ponder the orchard. Although it looks like it has always belonged here in the Mesilla Valley, its existence here in the desert is not natural; should it stay or should it go? Is it what we see or what we think we see? This is the actual orchard on irrigation day; the photo at the top of this post has been flipped upside down. It's not easy to see which is real and which is perception. 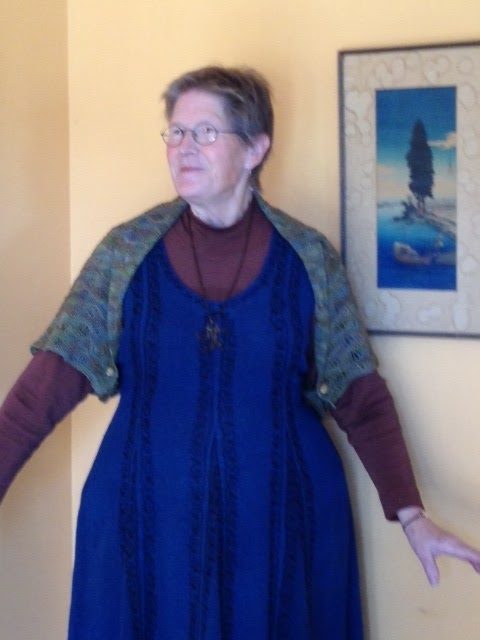 This is the third shrug (also jokingly known as a shroud in our family) that I have knit for my sister. You can see the first one here and the second one here. This time, the pattern is a different one called the Calypso Shrug/Shoulder Wrap, and it comes from the book, Sock Yarn One-Skein Wonders, by Judith Durant. The shrug is essentially one long rectangle that is fastened with two buttons at the elbows. The lace is called "seafoam," and it is simple to do. 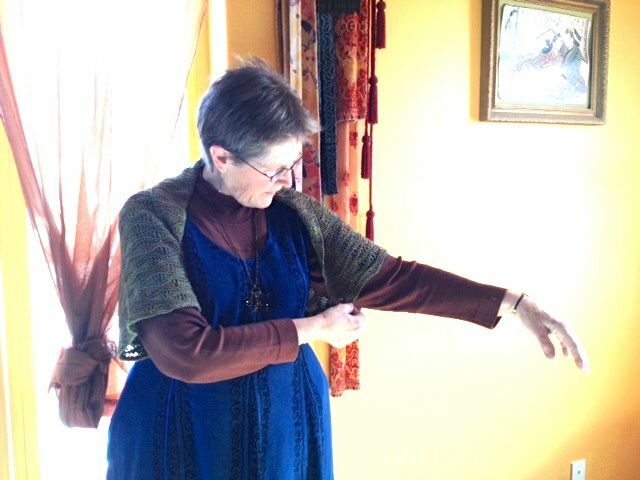 I am sure that lots of other lace patterns could be used in a shrug like this one. The yarn is Malabrigo Sock (100% merino wool) in the Primavera color way. It's an interesting color; in some light it looks rather khaki-ish, but close up you can see the color variations. I hope you can also see the bronze colored beads when you enlarge the photo above. This was my first project using beads in knitting, and it won't be my last. 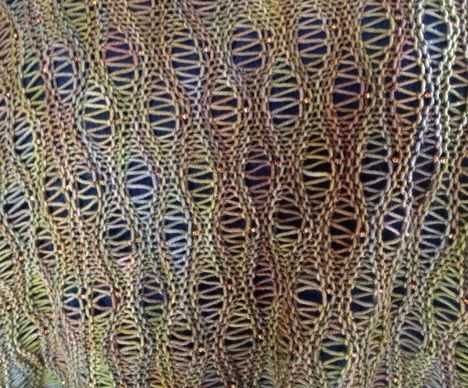 If you are interested in beaded knitting, check out this article which will tell you a great deal of what you need to know. There are different ways to get the beads on to the yarn. I just followed the directions in the book and used a crochet hook to place each bead as its stitch came up. The only bad moment was when I accidentally harpooned myself in the leg with the very tiny crochet hook, but that's a story for another day. The possibilities for beaded work are endless, I'm sure. I can't wait to try again. (Just as soon as my leg heals). 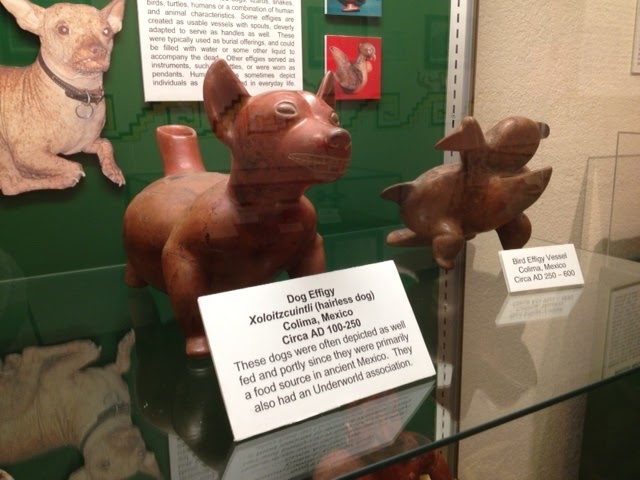 We went down to see the El Paso Museum of Archeology a few weeks ago. We've passed the building many times as we've traveled the Transmountain Highway into El Paso on our way to the airport, but never had the time to stop. The building is much larger than it seems from the outside. We promised ourselves that we would check out the desert trails in the surrounding 15 acres the next time we visited; as it was, the hour we had available between dropping off and picking up visitors at the airport gave us time to look at only part of one of the wings of the museum. After all, the museum exhibits cover 14,000 years of prehistory! 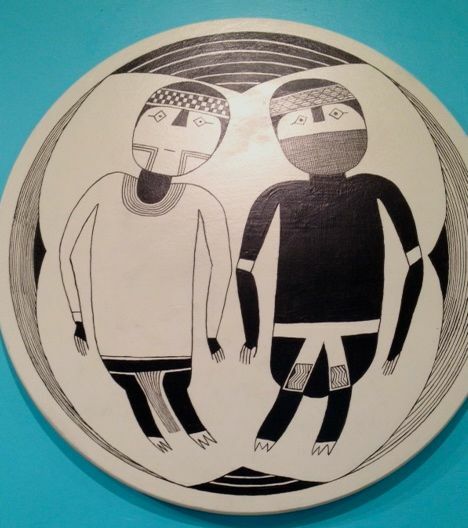 I spent most of my time with the Mimbres Twins exhibit that illustrated a hero twin myth as commemorated by the Mimbres peoples in their pottery. According to the Smithsonian: The Mimbres occupied the somewhat isolated mountain and river valleys of southwestern New Mexico from about 1000 to 1250 AD. (More here). 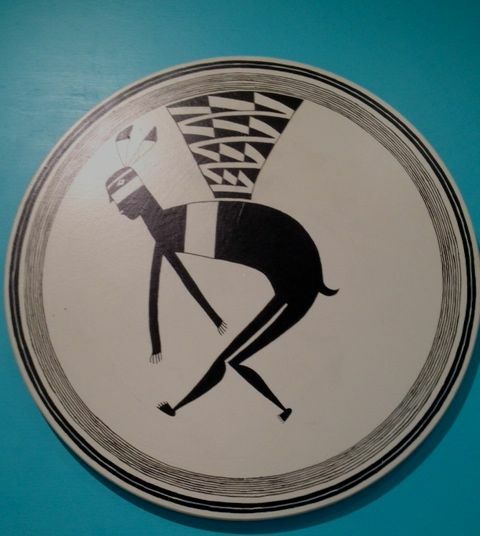 You can see a pdf version here of the Mimbres Twins pamphlet that is sold by the Museum; it contains the complete myth and more illustrations from the exhibit. 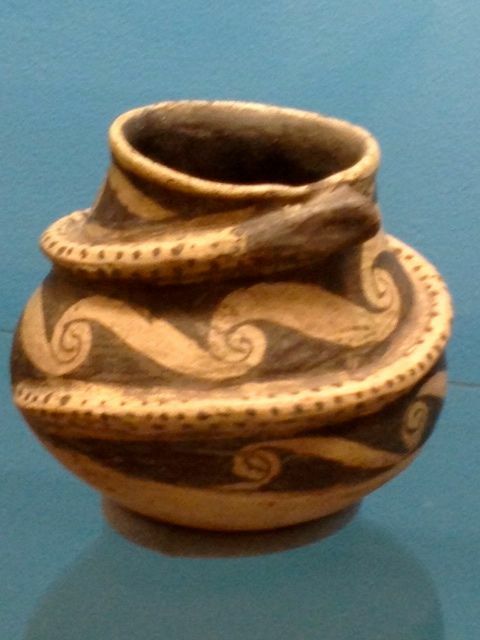 Next time, I plan to continue my explorations and get the whole story on this snake jug (from Mexico, as I recall) and this wonderful dog effigy, which reminds me of our own Little Pete.